Cleanliness is next to godliness, or so they say. 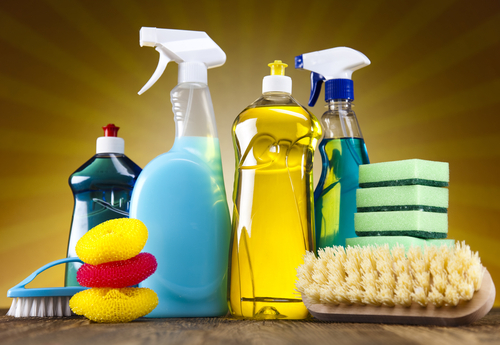 Chances are, if you've moved into a new home - or if your house is on the market to sell - you're going to need some good cleaning products beyond good 'ol elbow grease. Why spend money on name brands when you can make some at home that are just as effective? Check out some great recipes below! This gentle cleaner takes about 2 minutes to make and makes 16.5 ounces. Combine ingredients in a 24 ounce squirt bottle (or empty liquid dish soap bottle) and shake well to emulsify. It's works great on countertops, too! This recipe makes enough for 32 loads of laundry. Stir ingredients in a bowl until clumps are eliminated. Transfer powder to a plastic storage container. Use 2 Tablespoons per wash. This recipe harnesses baking soda's gentle abrasiveness, vinegar's acidity and the stain-lifting power of the fizz created by mixing the two, plus tea-tree oil's antibacterial capabilities. Pour baking soda directly into the toilet bowl, add oil, then vinegar—in that order. Let water effervesce for several minutes, then scrub bowl with brush. Flush. Use rubbing alcohol and white vinegar to clean windows, mirrors and car windshields. Put the first 4 ingredients into a bottle and shake. Add the soap and shake well. Spray windows; wipe with newspaper. With these easy recipes, your house will be spotless in no time! (Whether or not this actually makes you godly is still to be determined.) Happy cleaning!